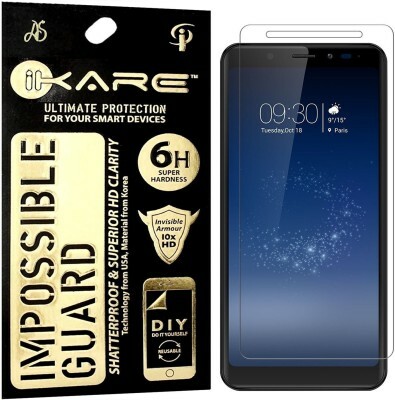 This is the latest Micromax Canvas Infinity glass fiber from the iKare Impossible series. Glass fibers are not tempered glasses but have embedded glass filaments for reinforcement, so while they provide the same protection as a tempered glass for Micromax Canvas Infinity would, they are also unbreakable and re-usable! Easy to apply and re-apply even for a novice user. The anti-glare shatter proof screen protector is made according to the dimensions of the Micromax Canvas Infinity. Perfect fit and relatively easy to apply, the screen protector leaves no bubbles behind. Smooth surface prevents finger prints on the screen. Rounded edges make sure that the glass covers the phone screen easily and fully. Oleo phobic coating makes sure that there is no smear or scratches on your glass. Impossible glass fibers are almost as thin as a normal matte screen guard but it is shatter proof and real tempered in nature.